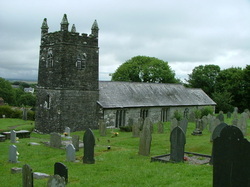 St Werburgh is the parish church. There was a Wesleyan chapel as well as a Bible Christian chapel at Canworthy Water. The main part of the parish includes the villages of Warbstow, Warbstow Cross and Trelash, as well as a number of hamlets. The enclave, one of the few remaining in England, is separated from the rest by about 150 metres and includes the hamlet of Canworthy Water. Email me at weekstmaryopcATgmail.com for FREE specific LOOK UPS in the parish of WARBSTOW.